Lesson #1. If you let your guard down, even for a moment, you can and will be robbed. It happened to me on a trolley in Quito, Ecuador. It happened to Steve at a train station in La Spezia, Italy coming back from a day in Cinque Terre. We had been traveling as a foursome, but on this day the Sharps stayed in Florence, and we decided to head to the Mediterranean Coast one more time. And, Steve and I had been staying right beside each other. But, for a few minutes, I stayed inside the train station while Steve went outside to double check that we were indeed at the right place to catch our train back to Florence. A very animated man came up and started talking to Steve, distracting him. No doubt his accomplice was busy stealing Steve’s wallet during that brief encounter. We didn’t realize this until we were several minutes into our train ride, and Steve noticed that an important pocket was unzipped. Sure enough, his wallet was gone. He had been very diligent about keeping his wallet in a more secure location, but for just a brief time he put it in a more convenientplace. Savvy pickpocketers must have been seen their opportunity. His wallet contained some US cash, some Euros, his driver’s license, but most importantly, the two credit cards we were using for our trip. When we FINALLY made it back to our hotel, we spent several hours cancelling those cards (not so easy when you can’t just dial a 1-800 number). We were promised that replacement cards would be sent quickly, but who knew if they would arrive before we left the country . . . or the next hotel. Thank goodness we were traveling with some friends!!! And generous ones at that. We lived off of their credit cards and some cash that I still had for the next two days. Happily, the new cards DID find us right before we left Milan for Venice. Oh happy day!! LESSON RELEARNED. Here’s a beautiful spot in one of the villages of the Cinque Terre before the robbery. Lesson #2. Every individual and/or couple has his/her own travel style, pace, or personality. When you are on a cruise, THE BOAT decides the schedule. When you are on a group bus tour, everyone dances to the tune of the Tour Director. But, when you travel with good friends, some give and take is critical to success. Couple A likes to move at a brisk clip covering as much ground as possible in the shortest period of time. 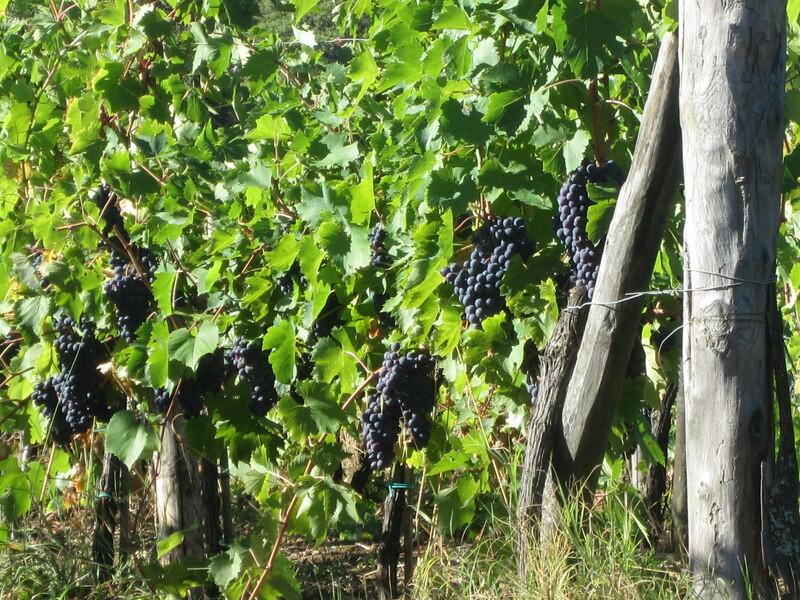 Couple B likes to stop and smell the roses (or, in Italy, stop and see the actual grapes in the vineyards). Couple A likes to pursue the historical aspect of the sights, while Couple B likes to make photos and poke around various shops. Neither way is more right than the other. Neither way is better than the other. What can be done to keep everyone happy and congenial? In our case, we did two main things. 1) We, in an unspoken arrangement, took turns setting the pace and making the plan. And 2) we sometimes went in different directions for a few hours or for a day. It mattered more to the four of us to maintain a rock, solid friendship than for someone to be “in charge.” It worked great. LESSON LEARNED. Lesson #3. If you leave for Italy as a committed non-drinker of alcohol, you can return from Italy as a committed non-drinker of alcohol. Someone had said to us before we left: “If you make it through Tuscany without drinking wine, then you’ve really done something.” But, I’m hear to testify that it was very much a non-issue. At no time — although wine was everywhere — did we feel pressured to drink any of it. We asked for water (“still” or “naturale”), and it was brought to us with no questions asked or raised eyebrows. Truthfully, it was sometimes actually more expensive to drink water than wine because in several cases wine was included in the price of the meal, but that was only a matter of a dollar or two. As I have stated in blogs before, drinking wine is not a sin issue to us, it is a personal choice we have made. We were glad that this was never a problem on our trip. LESSON CONFIRMED.